Yet another Brit-hating part-Irish president, Ronnie Reagan, would have probably just thrown things at the statue, or drawn moustaches on it, being unable to get a full erection at his age. 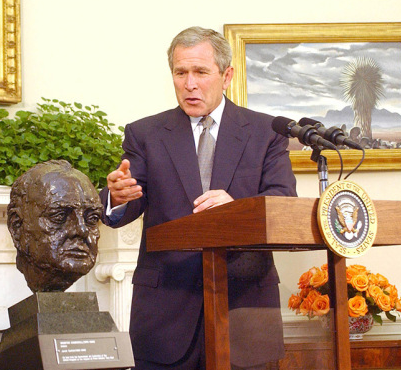 Even George Bush Sr, a 7th generation descendent of Captain Timothy Bush who actually fought AGAINST the British in the war of independence, would have been unable to resist his genetically encoded antipathy towards Great Britain, although he probably kept his acts low-key, like whispering taunts in Churchill’s bronze ears about the Yorktown surrender. 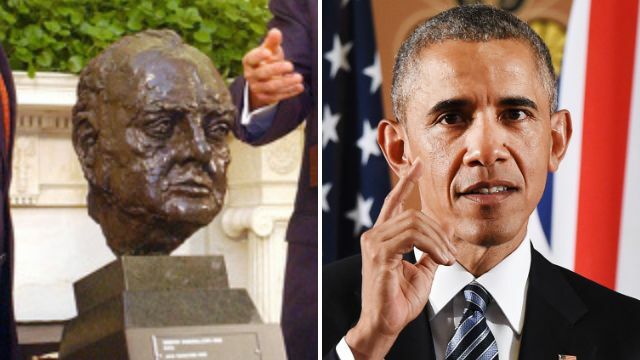 While his son, also a president, is known to have made a mockery of Churchill just by having his photograph taken with it. The report’s author, Dr Ian Yates, a pro-Brexit expert on this kind of thing, concludes that “Whenever a US President says or does something you don’t like, you can usually trace it back to one of their ancestors having a grudge against us, and Obama’s petulant ‘back of the queue’ warning therefore cannot be taken seriously in that context. It’s in his blood.